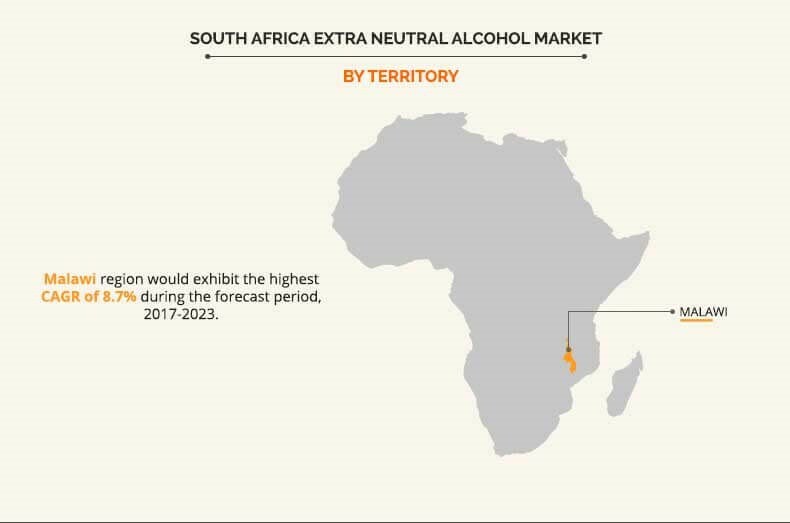 The South Africa Extra Neutral Alcohol Market size is expected to reach $1,064 million by the end of 2023. Extra neutral alcohol (ENA) is majorly used in the production of alcoholic beverages such as vodka, whisky, gin, liqueur, and others. Apart from this, it acts as an astringent and preservative, and is thus used as an essential ingredient in the manufacturing of several cosmetics and personal care products such as perfumes, toiletries, cologne, hair sprays, air fresheners, and detergents. It is used as an ideal solvent in the production of some lacquers, paints, and inks for the printing industry. Recent developments in the sugar industries and increase in the usage of extra neutral alcohol across various industries such as pharmaceutical, cosmetic & personal care industries for various applications have increased the growth of the extra neutral market in African countries. Many developing countries in Southern Africa possess the potential to produce ENA with benefits extending into the social and economic spheres. Rapid urbanization and improvement in financial condition have fueled the demand for different and modern alcoholic beverages such as sparkling wine, vodka, whisky, gin, and others in the developed economies such as Europe and North America. Moreover, high standard of living, rise in disposable income, and western influence have fueled the demand for more sophisticated, moderated, and premium beverages among young generation in the emerging countries such as India & China. According to the United Nations, the global youth population is estimated to rise by 7% to 1.3 billion before 2030, which is anticipated to drive the alcoholic beverages market. This in turn supports the growth of the South Africa extra neutral alcohol industry. Government is imposing high taxes and stringent laws on the availability of alcohol, owing to increase in alcohol abuse, which is projected to hamper the growth of the market. Ethanol is highly corrosive and flammable in nature, and hence extra care needs to be taken during its transportation. Governments have mandated strict rules and regulations towards the transportation, which vary at the state level, thereby leading to additional tax challenges. In addition, the regulatory authorities of Africa have specified standards regarding the testing methods of ethanol used in food and other industries, resulting in high cost of production. All these factors are anticipated to hamper the growth of the market during the forecast period. The report segments the South Africa extra neutral alcohol industry based on territory as Malawi, Southern African Development Community (SADC) and Common Market for Eastern and Southern Africa (COMESA). COMESA held the major share in this market in 2017. Malawi is also expected to witness high growth during the forecast period. Major players in the South Africa extra neutral alcohol market are Illovo Sugar (Pty) Ltd., NCP Alcohols (Pty) Ltd., USA Distillers, Agro Chemical and Food Company Limited (ACFC), Sasol Solvents, Mumias Sugar Company, Tag Solvent Products (Pty) Ltd., Swift Chemicals (Pty) Ltd., Enterprise Ethanol, and Greenpoint Alcohols (Pty) Ltd. The report provides an extensive analysis of the current & emerging market trends, and opportunities in the South Africa extra neutral alcohol market. The report provides a detailed qualitative and quantitative analysis of current trends and future estimations that help evaluate the prevailing market opportunities. An extensive analysis of the market is conducted by following key product positioning and monitoring of the top competitors within the market framework. The report provides extensive qualitative insights on the potential and niche segments or regions that exhibit favorable growth. 12.9. NCP Alcohols (Pty) Ltd.
12.13. TAG Solvent Products (Pty) Ltd.
Change in perception of people towards alcoholic beverages has changed the market dynamics. Rise in alcohol consumption among female consumers has urged the market players to increase the production of alcoholic beverages, thereby fueling the demand for extra neutral alcohol. The market possesses high growth potential in future in the developing regions such as China and India, owing to increase in working young population and rise in disposable income. Improved standard of living of consumers further facilitates the adoption of premium alcohols, thus boosting the extra neutral alcohol industry growth. The brewing companies need to address the rapid change in demand for consumers to gain a stronger foothold in the market. Collaborations and acquisitions are the key strategies followed by the companies to sustain in the market, as in-house capacity building is expected to be difficult for some of the novice players in the market. "South Africa Extra Neutral Alcohol Market"